In this book, native popular musicologists focus on their own popular music cultures from Germany, Austria and Switzerland for the first time: from subcultural to mainstream phenomena; from the 1950s to contemporary acts. Starting with an introduction and two chapters on the histories of German popular music and its study, the volume then concentrates on focused, detailed and yet concise close readings from different perspectives (including particular historical East and West German perspectives), mostly focusing on the music and its protagonists. Moreover, these analyses deal with very original specific genres such as Schlager and Krautrock as well as transcultural genres such as Punk or Hip Hop. There are additional chapters on characteristically German developments within music media, journalism and the music industry. The book will contribute to a better understanding of German, Austrian and Swiss popular music, and will interconnect international and especially Anglo-American studies with German approaches. The book, as a consequence, will show close connections between global and local popular music cultures and diverse traditions of study. 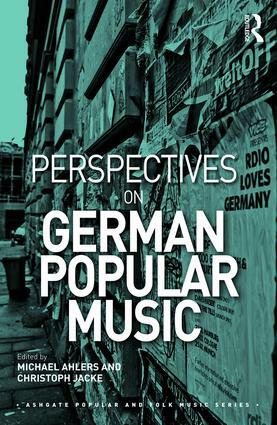 "You can find numerous good, and some excellent, articles within Perspectives on German Popular Music which, even in their brevity, are important to further the academic discourse surrounding popular music in German in its entirety." "This edited collection offers interesting kaleidoscopic reflections on German popular music cultures, through musicological, sociological, and media studies perspectives. (…) It is a welcomed introduction to a large linguistic and cultural musicscape, for too long neglected and which international scholars should start embracing." "The book offers fascinating studies of artists and genres that have been marginalized in popular music studies, including West German heavy metal, Frank Farian, Helene Fischer, Modern Talking, and the Hamburger Schule, to name only a few. It stands as an important contribution to the study of popular music from German-speaking countries, the historiography of popular music studies in these countries, and the continuing project of legitimizing this discipline in the academy." 34. German Music Talent Shows Nick Ruth and Holger Schramm . Michael Ahlers has studied music education, German, and musicology. He worked as an editor and ran a company for music production. His PhD was on human-machine interfaces in music production software. He is Professor of Music Education and Popular Music at the Leuphana University of Lüneburg, Germany. His main research is on empirical music pedagogy, creativity and improvisation, as well as popular music studies. Christoph Jacke has studied communication and media, politics, and English. He has worked as a music journalist. He is Professor of Theory, Aesthetics and History of Popular Music, and Director of the BA and MA programme in Popular Music and Media at the Department of Music at the University of Paderborn, Germany. His research focus is on media, culture and communications theory, cultural studies, celebrity studies and popular music studies.